This photo was taken with a phone so it's a bit low-res. But the food was low res also, chunky pixels, no fine chopping with this dish. The bowl in the top LHS is a salad with greek yoghurt, cucumber, and fresh dill and lemon juice. 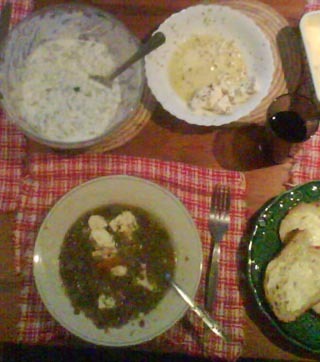 The bowl in the RHS is bulgarian feta sprinked with oregano and olive oil.